The singer-songwriter Gregor Meyle is ambassador for conscious hearing and supports the Hear the World Foundation in helping children in need with hearing loss and to raise awareness for the importance of good hearing. The Hear the World Foundation has a high-profile backer from Germany. The singer-songwriter Gregor Meyle is ambassador for conscious hearing and supports the foundation to help children in need with hearing loss and to raise public awareness for the importance of good hearing. Hat, glasses, beard – and a guitar always within reach. This is Gregor Meyle, who has been enjoying success on German stages for years. With around a hundred live performances in clubs, town halls and large open-air venues each year, he has acquired a loyal fan base – and with his poetic songs, he has reached the top ten on the German album charts. The 39-year-old lives for music, which is one reason why good hearing is so dear to his heart. 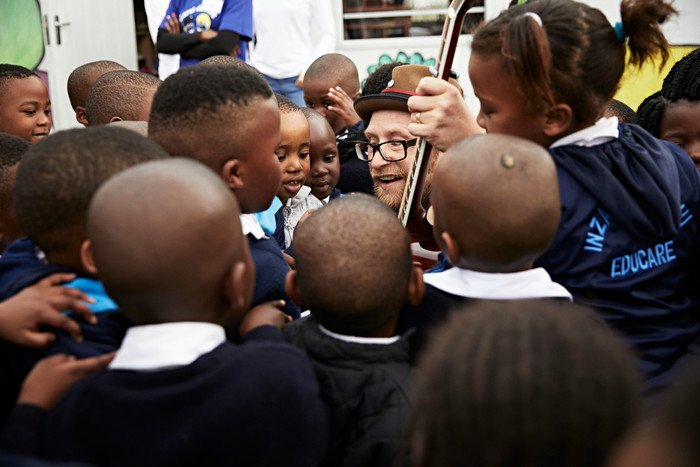 In July 2018, Gregor visited a Hear the World-funded aid project in South Africa. The project's target was to screen the hearing of children from Cape Town's townships with the aid of a newly developed hearing test app, and to fit children identified with hearing loss with new hearing aids. Gregor supported the project on-site by playing music with a group of schoolchildren during a speech therapy lesson - and thus animated them in a playful way to develop their language skills.